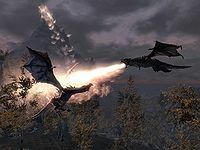 Odahviing is a Dragon that becomes your ally as part of the main quest. He can be summoned with the Call Dragon shout only while you're outdoors. This shout is simply his name, Od-Ah-Viing, Snow-Hunter-Wing. He can be seen flying around The Throat of the World, awaiting your call, once the main quest is complete. He can be very useful at any level as he is impossible to kill and won't leave you until all nearby enemies are dead. He uses the Fire Breath shout and standard dragon melee attacks as his weapons. Zok frini grind ko grah drun viiki, Dovahkiin. Ah. I forget. You do not have the dovah speech. My... eagerness to meet you in battle was my... undoing, Dovahkiin. I salute your, hmm, low cunning in devising such a grahmindol - strategem [sic]. Zu'u bonaar. You went to a great deal of trouble to put me in this... humiliating position. Hind siiv Alduin, hmm? No doubt you want to know where to find Alduin? Rinik vazah. An apt phrase. Alduin bovul. One reason I came to your call was to test your Thu'um myself. Many of us have begun to question Alduin's lordship, whether his Thu'um was truly the strongest. Among ourselves, of course. Mu ni meyye. None were yet ready to openly defy him. Unslaad krosis. Innumerable pardons. I digress. His door to Sovngarde is at Skuldafn, one of his ancient fanes high in the eastern mountains. Mindoraan, pah ok middovahhe lahvraan til. I surely do not need to warn you that all his remaining strength is marshalled there. Zu'u lost ofan hin laan... now that I have answered your question, you will allow me to go free? Aam? Serve you? ...no. Ni tiid. If and when you defeat Alduin, I will reconsider. Hmm... krosis. There is one detail about Skuldafn I neglected to mention. Only this. You have the Thu'um of a dovah, but without the wings of one, you will never set foot in Skuldafn. Of course, I could fly you there. But not while imprisoned like this. Indeed. Orin brit ro. I cannot leave here until you defeat Alduin, which you cannot do without my help. Zu'u ni tahrodiis. It was you that lured me here and took me prisoner... vobalaan grahmindol. I have done nothing to earn your distrust. Hin aar, orin nu. And yet here I am, still your prisoner. You will release me - ro laan - if in return I promise to take you to Skuldafn and stop helping Alduin? And you can trust me. Zu'u ni tahrodiis. Alduin has proven himself unworthy to rule. I go my own way now. Free me, and I will carry you to Skuldafn. Faas nu, zini dein ruthi ahst vaal. Saraan uth - I await your command, as promised. Are you ready to see the world as only a dovah can? Zok brit uth! I warn you, once you've flown the skies of Keizaal, your envy of the dov will only increase. Amativ! Mu bo kotin stinselok. This is as far as I can take you. Krif voth ahkrin. I will look for your return, or Alduin's. Odahviing's level is randomly determined when you enter onto the great porch of Dragonsreach during The Fallen quest, his level is then later reset as Dragonslayer ends on the death of Alduin but from that point is permanent. When his level is determined, the version is randomly chosen from all eligible ones. For example, the Odahviing for a level 18 player can be either level 20 or 40, but not 50. "Odahviing" literally translates to "Snow Hunter Wing". According to Esbern, it means "Winged Snow Hunter." When summoned, he will begin to fly towards your location from the Throat of the World, and based on the predetermined distance between you and the Throat of the World, he can take anywhere from five to ten seconds to arrive. 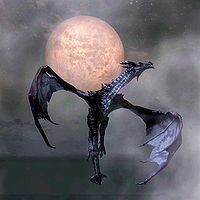 When summoned on the Throat of the World, he will appear to vanish from his usual mountain cycle and then appear somewhere else nearby, and proceed to fly towards you from that position instead. 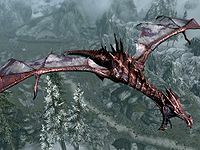 If you use Dragonrend on Odahviing atop The Throat of the World, he will continue to circle the area as if nothing had happened. If he is downed in battle either from enemies or friendly-fire, you can choose to speak to him (non-dialogue menu based) and can hear him say various single sentences before he flies off. Odahviing is leveled, but at a substantially higher level than you until a maximum of level 50 is reached when you are level 36. For this reason, it may be better to start The Fallen at higher levels when you will find him an easier target. Also, with the exception of The World-Eater's Eyrie, Odahviing's level will remain as it was when first encountered, so if The Fallen is done early, Odahviing will become a decreasingly effective combatant as you level up. At his lowest level, Odahviing is as strong as a Blood Dragon. While at his maximum level he has the same status as an Ancient Dragon. You are able to ride Odahviing with the Dragonborn expansion. The easiest way to do so is to use the Bend Will shout while he's circling the Throat of the World. However, it is also possible to keep him around long enough to use Bend Will after using Call Dragon. Odahviing will not come if called on Solstheim. Odahviing may not appear when called for the first time. It is possible that when called he won't attack. He just flies around making noise. This has been seen when you are in combat with some other dragons. This page was last modified on 4 December 2017, at 15:13.